Page 61 - Seeking answers? Join the Tom's Hardware community: where nearly two million members share solutions and discuss the latest tech. Everything running fine, running Build 15063. Was running Insider build 16257, but it was unstable and has a variety off issues from random crashes to general random freezes with different software. So I went back to the current build 15063. I've had my share of problems too with Windows 10. I now delay all updates so I can check to see if people are having problems. I only run them manually from Microsoft. That way they run a compatibility check. My last computer was ruined with the 1511 build. The chip is no longer being made and even if I found a way restore it, I would not be able to run Windows 10 so I bit the bullet and bought a new one since mine was five years old. If you delay the updates and do the manual download it might save you some headaches. Of course, a new computer won't have the issues but I still don't want any automatic updates in case there is a problem. It sounds as though you can restore your computer and at least it's a test computer and not your main one but I totally understand your frustration. One thing you could try is updating your drivers and bios if you haven't done that already. Those Microsoft kernel updates can be deadly. Yeah I scaled back on the Insider updates to just fixes and drivers on my main machine. I don't like to have to reload everything all that often. Windows doesn't take long to install, it's all of the other things that take forever. I really don't like doing images either as I always believed a fresh clean install normally works best. So yes, I do have a test box that I may or may not run the Insider Builds on, haven't made that choice yet. My first impression, comparing it to Windows 7 and earlier is that it's ugly. All glaring whitespace with sharp edges and solid borders; it's just really really ugly. Comes with tons of bloatware which is quite annoying to get rid of, and customizing the start menu is even more of a hassle. The UI is really delicate and easy to destroy; a lot of the display files are tied into the apps, so removing certain ones can make your text and windows disappear entirely (which is why I'm back to windows 7; couldn't deal with it at all). Having literally every aspect of the interface outside of protected system files is a retarded design flaw. My windows 10 is installed on SSD Samsung Evo 840 250GB , loading files is slower then windows 7 i dont know why, even in external drive same take time to load app logo or whatever? It is same thing on my notebook, it takes 3 times longer on a ssd to load compared with windows 7 but on my desktop which can be seen in my sig, there is no load time diference, windows 10 loads as fast as 7. Since I am not a software engineer, an electronics engineer, nor a "computer hobbyist", my thoughts on Windows OSes are from the perspective of a computer user. I simply view a computer as a tool that can help me perform certain activities. The activities that I want the computer to assist me in are: 1) collecting information (i.e. web browsing), 2) storing information (e.g. accumulating data into a database or capturing my thoughts on a subject in a word document), 3) sorting information (e.g. manually storing documents into a hierarchical filing system or querying a database), 4) manipulating data (e.g. using a spreadsheet to perform calculations, using a mechanical design program to develop a 3D model of a a part, or using an image processing program to change the contrast of a photograph), and 5) to share the results of these previous activities with others (e.g. sending an email, sharing a file, or posting a YouTube video. With the above "wish list" in mind, I would have to say that all the windows operating systems of the last two decades are successful in varying degrees. But, it seems to me that they are getting progressively worse in some aspects. My main complaint is that when I buy a tool, albeit a computer or a hammer, I expect to have a clear understanding of what that tool can do for me, a clear understanding of how to use that tool, and I expect the tool to save me time/effort/money. With a simple tool like a hammer, it's purpose and how to use it are fairly intuitive, so the manufacturer doesn't really have to provide documentation outlining its benefits or usage instructions (although they may advertise how their product is superior in balance, grip comfort, etc. and most will have a safety warning about the risk of shattering the head if used to hit another hammer, but, I digress). Determining the cost/benefit of the hammer is left to the buyer, but, there is a generally accepted understanding that the hammer is unlikely to require any periodic maintenance and that it will last for decades. On the other hand, computers and the software used to operate them are extremely complex. Just by looking at a computer or its operating system, a buyer can't tell exactly what it will do, how fast/well it will perform, how much maintenance it will require, nor how long it will last. This makes it nearly impossible for a non-IT buyer to access the cost/benefit of a computer or OS. If they are really motivated to understanding the tools, they have to either go to school to become an IT professional or spend countless hours reading blogs & websites and watching YouTube videos. But, if they choose to do so, they need to factor all that effort into their cost/benefit analysis and they will most likely decide that it's in their best interest to just buy a PC that comes preset with an OS and a suite of commonly used software. And, if it stops working it's best to either have an IT professional fix it or just throw it away and get a new one. I would liken this to buying a Crescent wrench instead of buying sets of metric and SAE combination wrenches, gear wrenches, and 1/4", 3/8", and 1/2" drive ratchet wrenches and sockets. If you only occasionally need to tighten a bolt, the Crescent wrench is fine, but, if you are a full time mechanic, you'll want the whole assortment of wrenches because, in the long run, they will pay for themselves. Getting back to Windows 10, I would have to say that, on one hand, it is amazing all the things that it can do, but, on the other hand, it is appalling that the buyer doesn't really have a clue exactly how it does what it does. In the old days of "sneaker net", I knew exactly what information I was sharing and with whom I was sharing that information because I'd copy a file (e.g. a Word document) onto a floppy disk, carry it to a co-worker's desk, and give it to them. These days, I have no idea what information my computer is exchanging over the web, where it is going, where it is being stored, who has access to that data, or what they are doing with it. Personally, I wish all OSes were designed such that all data going out to the web had to be user approved and all incoming data had to be in response to a user request (e.g. go to this web page or download this file). As to the quality of Windows 10 (and all it's recent predecessors), I'd have to say it is a PIG (no disrespect intended to pigs!). With all the legacy crap it carries, I'd liken it to buying a new Corvette and finding out that GM had evolved the car since the 50's without deleting any obsolete hardware - it would have fuel injection, but also a carburetor, electronic ignition, but also a points distributor, bluetooth audio system, but also an 8-track tape deck, etc., etc..
For the past week, I've been struggling to do a fresh install of Win 10 on one of my laptops. I started with a simple install to a cleaned and reformatted HDD from an .iso file I downloaded from the MS website to a USB stick. I just installed per all the MS defaults and all went well. But, I was not happy with the disk partitioning because of the way file explorer displays things. I want a partition for the OS, a separate partition for programs that I install, and a partition for my files (Word docs, Excel spreadsheets, music, photos, PowerPoint files, MS Project files, etc.). I want to store these types of files in a directory tree of my own design. I most certainly DO NOT want to store my files in my user folder. When I open file explorer, I want to see a drive (partition) that, when opened, only shows the folder tree that I have developed. I DO NOT want to see links, favorites, downloads, desktop, etc.. I also don't want to see "Quick Access", "Libraries", "Frequent Folders", or "This PC". When I open file explorer, all I want to see is C:, D:, etc. and I'd like to be able to hide any drives that contain system files (e.g. if Windows OS is on partition C:, I want it to not display in file explorer). I also want to be able to open multiple instances of file explorer so that I can more easily drag and drop files from one open folder to another. 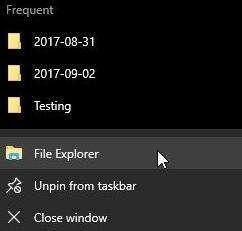 This used to be possible, but, by default, it seems that Win 10 won't open multiple instances of file explorer unless Win 10 opens the second instance on its own (e.g. if you plug in an external drive) - I'll have to Google and see if there is a workaround for this. Suffice it to say that file explorer in Win 10 is an abomination that does a horrible job of helping the user locate a file. It is almost easier to navigate thru directories from the DOS command line. Another serious flaw in Win 10 is that it still has various system control/preference settings scattered all over the place (Settings, Control Panel, Computer Management, Task Manager, System Information, System Configuration, etc., plus all their sub menus). Even God Mode doesn't provide access to all the various settings. All in all, for those who are not at all computer saavy, Win 10 is like a Crescent wrench, for the very tech savvy, they can probably navigate their way through the Win 10 setup and preference options to make it work the way they want, but, for those of us who aren't very computer tech savvy, but know exactly what we want the computer to do, we're in for headaches because Win 10 is quite a Byzantine maze! Win 10 absolutely does this! Repeat that...another File Explorer instance opens up. It may be a driver issue. My brother got the Windows 10 upgrade option when it was released and with no official video driver support, it did NOT perform well. Hold start(winkey on the keyboard between CRTL and ALT) and hit E to open extra explorer windows. Works on older version as well. Short keys can save you time. So, Windows 10 after time, as well as with my sister's laptop and a newly built system. Basics? Windows 10 still works. But needs to stop splitting and hiding settings, some in its fancy user-facing "settings" panel, some in Control Panel, some in apps. Focus them all in control panel, even if they're duplicated elsewhere. I have to relate recent experience with this, as well, as my sister was having trouble with her printer (and while not a "computer geek," usually has a "Decent working knowledge" of getting around her PC. The place Windows kept taking her didn't let her set a default at all, and the "real" control panel is hidden (and no, she's not used to typing it in to find it.) She's also kind of torn on the new start menu. She has a touchscreen laptop so it's not as bad for her (it works in that environment,) but it was frustrating her trying to find things. This is, of course, also partially HP's fault with their software for the printer causing problems as well as just the junk preloaded on a new PC anyway. I still do not like the "flat" look, but to my understanding that's being changed. Performance and stability wise, it gets a (heh) 10 out of 10. After initial stumbles when it came out, I think I've only had an actual Windows issue... twice. The few other issues have been driver or software related. Note, I use Start10 on one PC and ClassicShell on my other. All I really care about in a OS is performance and stability. Win 10 does a pretty decent job here. I clung to my Windows XP for many years, so I hardly got to know Vista or Win 7. My parents gave me a old Vista computer which could barely open a folder in explorer without hanging. That computer got the Linux treatment, the machine was not a dog at all. I bought a refurbished machine on EBay for $50 which had Win 7 Pro installed. It looked so much like Vista I was kind of biased. I put Linux on it as a duel boot machine. This one got the free Windows 10 upgrade about six months after I bought it, so I hardly got to use the Win 7. I use this machine to play music mostly, and I rarely boot the Windows on it. I also bought a cheap laptop that had Windows 8.1 from the factory, this was a week before Windows 10 was to be released. I agree with all of the negative comments I've read over the years about Windows 8. I upgraded the laptop to 10 right away. It looks exactly like Win 8 to me. I started out not really liking the interface much. About 10 months ago I built a new machine, I could of payed twice as much for Win 7 Pro, but I chose to put Win 10 Pro on it. All of the parts where brand new except for the video card, an older NVIDA branded GTX something or other. Windows update installed incorrect drivers for this card a number of times. I made a rule in the Group Policy Editor to stop that from happening, and all was good. I don't like the stupid start menu or the Edge browser, and I shut Cortana off. I hated it when Win 10 would always want to change my default programs every time I double clicked a file. I found a setting in the Group Policy Editor to stop that nonsense. Every version of Windows I've used, since 3.1, needed some tweaking to make me happy, and Win 10 is no different. All in all, I'm pretty happy with it. Some of my software is very old, and it runs fine. Even on the old machine and the cheap laptop, performance is good. My new machine hums right along, as it should, with six cores and 32 GB of ram. Just got the full Fall Creators update Version 1709 (16299.15). its not due out till Tuesday next week but normally the media creation tool is updated ahead of time, did you get it through the update tool or via Insiders program? Insiders program, we get it a few days early. I read that earlier after i read your 1st post and wondered if it was live yet. Hmm, way last few version updates have worked, if PC came with win 10 installed, it will get it 1st. So I better watch my mums new PC in coming days, as she will get it before me. Yeah, we get them a little early normally. Had the Insiders preview before and it had issues so I got rid of that and set the machine back to just fixes etc once I reinstalled Windows. This one isn't really all that big of a deal, does everything on it's own. With Window Fall Creator update, my SSD total boot up time from entering BIOS password to window login just drop from 20 second to 11 second. Quite a big differences. Wondering what make Window 10 boot up faster. Better hibernation management and fast startup? Hibernation and Window/BIOS fast startup is disable. Like before the Fall Creator update. Now going to have a water in kitchen is slower than starting PC. Well it is always good to get a free boost. I always found 10 to be very fast in that respect on any SSD. I though there were doing incremental process/program start when boot up thus giving effect a faster bootup. You driver seems to be load instantly now and i also notice connected faster now instead of after login in. Maybe the OS is now more optimise or there are more stuff/feature being remove from the OS. I put win 10 version 1709 on all 3 of my computers. My 2006 Gateway laptop with a little duo core Intel processor has never run better! My Dell Insperion with a smooth Intel i5 4 core cpu, and a pair off WD black drives, runs like a tornado now. I use my Dell for photography purposes mainly, win 10 runs my photo processing software better than 7 did. I also use Webroot anti virus on my computers, it really lets em breath.